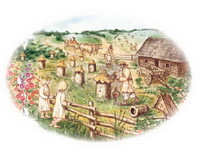 Thousand years ago, in the times of Kievan Rus’ – one of the most powerful states of the Middle Age, – honey and wax were main products of our state export, being supplied to all the countries of medieval world and forming the basis of domestic economy. Honey drinks were of a great popularity on those times too – our ancestors knew thousands of recipes for brewing them. People even called church holidays ‘mead’. 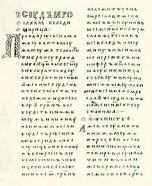 Hence, no wonder that in our first Code of Laws called ‘Russka Pravda’ (The Truth of Rus’) and compiled by Yaroslav The Wise, beekeeping was paid more attention than any other topics – seven chapters. In the year 6494 (986), Muslim Bulgarians came and said: “You are a wise and clever prince but you do not know the God’s law. Have faith in our Law and bow to Muhammad”. 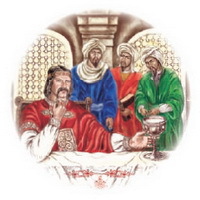 Volodymyr (the Great – Prince of Kievan Rus’) asked: “What is your faith?” And they answered: “In God we trust and Muhammad teaches us and we must circumcise, we must not eat pork or drink wine or mead and when we die we get women for lustful satisfaction. Muhammad shall give each one seventy beautiful women and choose one beautiful woman and put the beauty of all of them in one and that one will be his wife…” Volodymyr listened to them because he himself liked women and lustful things and he enjoyed those stories. However, he did not like the part about circumcision and pork meat and especially about drinking. He said: “The fun in Rus’ is drinking – we cannot go without it”. ‘Tales of Bygone Years’ (Rus’ Chronicle in Ipatievsky register) Translated by O. Makhnovets. 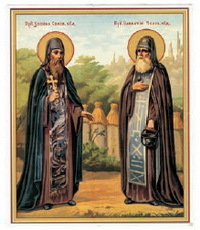 Since ancient times the saint patrons of beekeeping in Ukraine were St. Zosima and St. Savvatiy who in the XV century founded the Solovetsky Monastery on a group of islands in the Russian North. According to medieval chronicles, from the very beginning of its existence the Monastery had a bee yard, and that’s why people believe that these two saints have taught people to keep bees. Here is one of the legends about their deeds: ‘The two saints kept a bee farm and looked over it, though they never sold their bees. Then God put them to sleep for three days. At that time, the bees flew around the forests and people would take over the apiaries.’ Not surprisingly, therefore, that the two saints are depicted on icons with different beekeeping equipment of that time, beehives and bees. Interestingly enough, in the past people always kept an icon with the image of St. Zosima and St. Savvatiy at the entrance to the bee yard, and beekeepers did not start their work without praying first. St. Zosima’s day is celebrated on April 30. There was a saying: ‘Greet the bee on Zosima’s day and there will be hives and wax’. Not many people know that it was due to the bee-farming that the territory on which our people lived almost doubled owing to the bee-farming! The territory of Slobidska Ukraine (now it is the territory of Kharkiv, Donetsk, Sumy and partly Poltava regions) for a long time remained unpopulated until the first settlers came here at the end of the XVI century. Mostly these were older Cossacks, sometimes senior officers. Tired with war and military activities they were looking for peace and tranquillity. They made apiaries here, because beekeeping was closer to their souls that wanted conciliation. In particular, this was the way Ivan Sirko and Bogdan Kmelnitsky spent their last years. These territories suited this purpose most of all: they had lots of honey plants, virgin forests and the main thing was that they were protected against enemy raids. Thus, Cossacks stayed here and brought their families and friends. The farms grew around the apiaries, additional craft shops and residential buildings were constructed, roads, bridges and defence constructions were built. Eventually, in the middle of the XVIII century, the country was filled with small farms called ‘slobodas’. Therefore, the territory was called ‘Slobozhanschina’. In January 1814 prominent Ukrainian beekeeper and scientist Petro Prokopovych (1775–1850) constructed the world first frame hive. That invention created a revolution in the apiculture. In comparison, Rev. Lorenzo Lorraine Langstroth who is erroneously considered by many a frame hive inventor, patented his movable frame hive only in 1852. Today frame beehive is a standard for beekeepers in every country, and Ukraine is by right recognized motherland of the rational beekeeping. 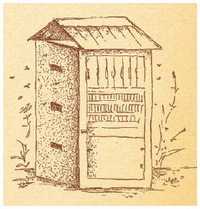 The invention of frame beehive was not the only achievement of Petro Prokopovich. In 1827, he opened the first world school of bee-keeping in Baturin, where he paid out of his pocket for education of poor peasants, which included not only the beekeeping profession but also reading, writing and arithmetic. Prokopovich had one of the greatest bee farms at the time, it had more than a thousand and a half bee families. Based on personal research, the scientist wrote a fundamental work on bee-farming called ‘Reflections about Bees’, which consisted of many volumes but unfortunately was never published. Ukrainian Laboratory of Quality and Safety of aic Products with a separate section dealing with beekeeping products. This is the largest institution of its kind in Ukraine and one of the largest in Europe. The laboratory boasts the cutting-edge equipment and does the entire range of research work required by the agrarian sector. Along with the National Agrarian University the laboratory is an offi cial partner of the Apimondia Congress Scientifi c Program. P. I. Prokopovych Institute of Beekeeping National Research Center with experimental apiary and unique Beekeeping Museum featuring collection that no other museum in the world even comes close to. Beekeeping production farm near Kyiv. The farm of mixed production and breeding type outputs wide range of beekeeping products including propolis, royal jelly, bred queen bees, and bee packages. Honey beverage factory. Located in a picturesque place just a few miles away from Kyiv, the factory produces over 20 types of various honey beverages using traditional Ukrainian recipes, which received numerous awards at the most prestigious international fairs. The factory also has an exhibition museum. The program includes tasting of beverages. Kyiv-Pechersk Lavra. This huge monastic complex inscribed as unesco World Heritage Site includes quite large monastery apiary. The Lavra’s monks make their own candles, honey, and honey beverages. Besides visiting the monastery apiary, the program includes visits to the Museum of Historical Treasures and unique collection of microminiatures. Andriyivskyy Descent. The program of each technical tour includes visit to this place called “Montmartre of Kyiv”, a neighborhood of cozy cafes, art galleries, and theaters in the shade of the majestic Church of Saint Andrew the First Called. Guests of the Congress can buy here any souvenir they could think of to take fond memories of Kyiv back home. Also, program of each technical tour includes lunch with local beekeepers in a traditional Ukrainian outdoor restaurant. Location – in Eastern Europe, incorporates Crimea Autonomous Republic. Capital – Kyiv (2,8 million inhabitants). Other big cities – Kharkiv (1, 68 million), Dnepropetrovsk (1,23 million), Donetsk (1,15 million), Odesa (1,12 million), Lviv (800 thousand). Ukraine is independent country under a mixed semi-parliamentary semi-presidential system with separate legislative, executive, and judicial branches. The country has a constitution. The head of state is a President of Ukraine elected by the direct popular vote by Ukrainian citizens who are 18 years and over. The highest legislative body of Ukraine is unicameral parliament – Verkhovna Rada. The highest executive body of Ukraine is the Cabinet of Ministers. Ukraine has a mostly temperate continental climate, although a more Mediterranean climate is found on the southern Crimean coast. Ukraine is a country with developed scientific and industrial base, a member of the World Trade Organization (from May 16, 2008). National economy includes such industries as heavy machinery, ferrous and nonferrous metallurgy, shipbuilding, production of buses, cars, trucks, tractors and other agricultural equipment, locomotives, machine tools, turbines, aircraft engines and aircraft equipment for power stations, oil and chemical industry and others. In addition, Ukraine is a powerful producer of electricity. Some sectors of economy of Ukraine are developing with high quality technologies. On a good level are put the production of carrier rockets, satellites and equipment for space exploration. Ukraine is a major manufacturer of military equipment – tanks, military transport aircraft, anti-aircraft missile systems, optical equipment. ….Ukraine is the largest country located fully within Europe? ….geographically, Ukraine is located in Central Eastern Europe? …..Ukraine is the fifth-ranked country in Europe (after Germany, Italy, United Kingdom, and France) and the 21st in the world population-wise? Ukraine is the home to 7.3% of the population of Europe and 1% of the world population? ……in Western Ukraine between the cities Uzhhorod and Rakhiv stands a historical marker ‘Geographical centre of Europe’? The status of this place was fixed at the congress of geographers in Vienna back in the XIX century, which became the first scientific attempt in the world to determine the centre of the European continent? ….four of ten European transport corridors are running thorough Ukrainian territory? …..Ukraine has more than a quarter of all fertile black earth in the world? …..the longest river in Ukraine is Dnipro? Out of its total length of 2201 km, 981 km is running thorough Ukraine. Dnipro is the third river in Europe in terms of the length and basin area (after Volga and Danube). Its source is the Aksenninsky Turf Swamp in the southern part of the Valdai Hills, and the river empties into Dniprovsky Estuary of the Black Sea. 65% of the total area of Dnipro basin is located within Ukraine? ….the longest cave is Ukraine is called ‘Optimistic’ and located in gypsum rocks of Podillya, Ternopil Oblast? In that cave the scientists have found and mapped 216 kilometers of passages, galleries, and grottos located 20 meters deep, which makes the Optimistic Cave the longest cave in the Old World, the longest cave in the world in gypsum rock, and the second-longest cave in the world (behind limestone Mammoth Cave in the USA). Next to it, and also in Ternopil Oblast, is the second-longest cave in Ukraine called Ozerna: its labyrinth is 114 km long. … Ukraine is a large grain producers (belonging to the top three of the largest barley producer). Along with France, Germany, and the USA, Ukraine is one of the largest producers of sugar beet, ahead of the neighboring Poland and Turkey. Ukraine is one of the seven largest producers of sugar, vegetable oil, pork, and potato in the world, and the fifth-largest honey producer in the world? … Ukraine spends US 590 million annually on its defense? Ukraine is the only country in the world which had voluntarily given up the nuclear weapons, and although the Hollywood producers like to show in their films the terrorists stealing nuclear bomb from Ukraine, it’s simply not true. …..Ukraine is the 4th-ranked country in the world in terms of the number of citizens with higher education? Ukrainian population is one of the most educated in the world, and the per capita number of people with higher education is higher than the average European index. … Ukraine has 5 sectoral state academies: Ukrainian Academy of Agrarian Sciences, Academy of Medical Sciences, Academy of Pedagogical Sciences, Academy of Legal Sciences, and Academy of Arts? … The majority of Ukrainian population (about 70 %) speaks Ukrainian language? It differs substantially from Russian. Our language is more beautiful and melodious. Ukrainian language is considered the third lovely-sounding language in the world after the French and Japanese languages, and the World Conference of Linguists held in Rome in the middle of the 1920’s recognized Ukrainian the second-melodious language in the world after Italian. Ukrainian language belongs to the most widely used languages in the world and is ranked 26th in terms of the number of speakers. It is also the second most-spoken among the Slavic languages after Russian. About 31 million people in Ukraine can speak Ukrainian. About 4.1 million Ukrainians living in the Russian Federation speak Ukrainian language. … The person to whom the most number of monuments was erected in the world is our Taras Shevchenko, a genial Ukrainian poet, artist, and thinker? … First kerosene lamp was invented in 1853 in Lviv by pharmacists Ihnatiy Lukasevych and Jan Zech who worked in the pharmacy ‘Under the Golden Star’? The same year, the first surgery was performed in a Lviv hospital under the light of a kerosene lamp. Soon, kerosene lamp was exhibited at the international fair in Munich where the invention was awarded a special diploma? … In the 1950’s the first computer in continental Europe was built by S. Lebedev, and the digital automata theory was developed by V. Glushkov, based on which new-generation computers were created in Ukraine (‘Ukraine’, МІР)? … The 1920s – 1940s witnessed creation of the largest charged particle accelerator in Europe, development and implementation of the theory of welding under the layer of flux (by Y. Paton)? … Trembita used by Hutsuls in the Ukrainian Carpathians is the longest wind musical instrument in the world? Apimondia is the International Federation of Beekeepers’ Associations and other organizations working within the apiculture sector that integrates leading specialists, scientists, businessmen and public figures of beekeeping industry. The headquarters of the Federation is located in Rome. The head of the organization is the President of Apimondia – Gilles Ratia. The Secretary General of Apimondia is Riccardo Jannoni-Sebastianini. Today members of Apimondia are represented by different beekeepers association from more than 115 countries. Every two years since 1897, Apimondia is holding in different countries International Apicultural Congresses that are the largest events in the world of beekeeping. Apimondia facilitates scientific, technical, environmental, social and economic development of beekeeping in different world’s countries. International Apimondia Congresses have an aim to give an opportunity of exchanging of information, personal experience and achievements among beekeepers, scientist, honey-traders and equipment manufacturers, agents for development, technicians and legislators. The right to host the Congress has to be won in competition among the other applicants by the clamming country. 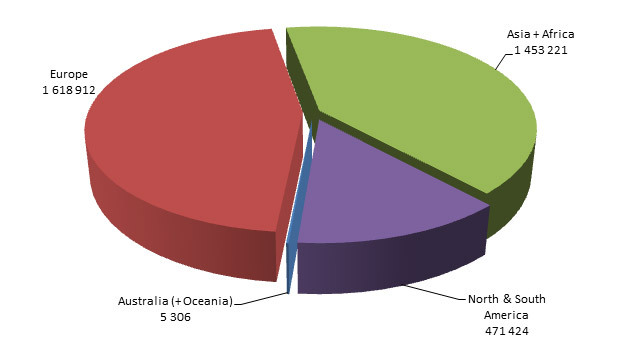 Nowadays, the Apimondia structure includes apiarianassociations frommore than115 countries.The total number ofbeekeepers, worldwide apiarian association members that are a part of Apimondia, encounters3,548,863 people. The total number of professionals who are not beekeepers, but their work is closely related to beekeeping (scientists, apitherapists, educators, traders, equipment and medicinal products manufacturers, veterinary drugs manufacturers, representatives of tourist companies, government agencies and others), and who are considered to be a part of Apimondia, encounters about 15% of the number of beekeepers – worldwide beekeepers associations members. Location – International Exhibition Centre, Brovarsky Ave 15, Kyiv. Main advantages – the most prestigious, massive and comprehensive event in beekeeping, both on domestic and global level. Size of event – the third in scope, after the Eurovision Song Contest 2005 and the European Football Championship 2012 event in Ukraine. Organizers – The Organizing Committee of the XXXXIII Apimondia International Congress (formed by the signing of the Letter of Agreement on September 16, 2009 in Montpellier (France) and implemented on September 19, 2009) consists of the representatives of the International Federation of Beekeepers’ Associations Apimondia, and Ukrainian representatives – members of the national beekeeping organizations “Beekeepers’ Brotherhood of Ukraine” and the “Beekeepers Union of Ukraine”, also Director of Ukrainian Agricultural Products Quality and Safety Laboratory, Director of the International Exhibition Center and Director of Tourism agency “Terra Incognita. Official support in 2009 – The official Support is provided by the governmental organizations. The official letters were sent to the President of Apimondia from: Prime Minister of Ukraine, Ministry of Agriculture and Food of Ukraine, Ministry of Foreign Affairs of Ukraine, Ministry of Culture and Tourism of Ukraine, Kiev City Administration, Ukrainian National University of bio-resources and nature exploitation, Ukrainian Agricultural Products Quality and Safety Laboratory, P.I. Prokopovych Institute of Beekeeping” National Scientific Center, Ukrainian International Airlines. “Terra Incognita” travel agency and the exhibition company, International Exhibition Centre, etc. Official support in 2011 – On June 6, 2011, the President of Ukraine Viktor Yanukovych signed the order “On supporting of the International Congress Apimondia by the President of Ukraine” in order to promote the development of domestic beekeeping, to strengthen the image of Ukraine in the world and consolidate the international affairs. Also the Organizing Committee of the 43rd International Apimondia Congress received a letter of support from the Prime Minister of Ukraine Mykola Azarov. On July 14, 2011, the Organizing Committee of the XXXXIII International Apimondia Congress members and the Ministry of Agriculture and Food of Ukraine representatives signed the protocol of Intentions and the program of mutual cooperation in the preparation and holding the 43rd International Apimondia Congress in 2013. The Organizing Committee of the Apimondia Congress received an official support from the Ministry of Agriculture and Food Industry of the Autonomous Republic of Crime. Participants – more than 12 000 beekeeping industry representatives, from over 100 countries – the leading industry experts and specialists, scientists, international and national organizations representatives, public figures, manufacturers of beekeeping equipment and , veterinary products and other products related with beekeeping; exporters and importers of beekeeping products and also beekeepers both amateurs and professionals. Scientific program – the scientific direction of Apimondia Congress will be carried under the title: Beyond the Hive: Beekeeping and Global Challenges, and will be dedicated to studying of the potential of beekeeping industry in solving of the global problems facing humanity today. We believe that in today’s dynamic and globalized world the beekeeping science have to reach beyond the narrow field of specialization and take an active position in finding solutions to such important issues as environmental pollution and exhaustion of natural resources, poverty and social inequality, cultural barriers, pandemics, and diseases of human civilization. Having discovered one of the greatest wonders of nature, bee family and its products, we have to think how we can use their miraculous power to make our world better. Scientific program consists of: 7 plenary sessions of the Apimondia standing commissions; 5 plenary sessions of the Regional Apimondia commissions that will represent main achievements of the experts from five parts of the world; 16 thematic symposia within the seven Scientific Committees and the section of social and cultural aspects of beekeeping, proposed by the Ukrainian Organizing Committee; 4 Round Tables on the most important issues and problems of beekeeping. The scientific conferences are going to be held with the participation of over 800 scientists from around the world that represent about 400 scientific papers and over 800 poster presentations.The official language of the scientific program is going to be English. Also is going to be provided the simultaneous translation into Ukrainian and Russian languages. Working languages are : main (English, French, Spanish, Russian, Ukrainian, German) and additional (Korean, Chinese, Japanese). All informational materials will be prepared in these languages, as well as simultaneous translation will be held in these languages during the scientific program of the Congress and live broadcasting. Additional languages will be fully or partially involved in case of sufficient applications clearance for these. ApiEXPO-2013 – International Exhibition ApiEXPO-2013 will be held with the participation of at least 300 participants from around the world. International Exhibition Centre has 58 000 square meters for beekeeping companies from all over the world, so they can offer their products for thousands of beekeepers who want to find the best and latest in terms of sanitation, nutrition, veterinary medicine, apitherapy, tools, equipment, clothing, machinery, services materials, technology and other products associated with boost of productivity and innovation. Honey World Championship – more than 100 nominations for honey, beeswax, honey drinks and other beekeeping products with new, harmonized quality standards, as well as for innovations, inventions, collections, printing etc. Cultural and Social Program – There are going to be organized a lot of different events such as: the grand Opening and Closing Ceremony of the Congress, the national parties, flash mobs, promotions and contests for visitors, new records setting for Ukraine and Guinness book of records and etc. Also a number of priority Social and Cultural projects such as “Show Room”, “Video room”, “Apimondia open to the public”, “Apimondia for Children”, “Gallery of Contemporary Art”, “International Museum of Beekeeping” and this is not the whole list of events that will be provided to attract more people to participate in the Apimondia Congress. Contest Program (for Ukrainian participants) – The Contest program has an aim to find and show the most interesting, creative, informative and modern topics in Ukrainian beekeeping. It will have a lot of activities such as photography contest, contest of literary works, scientific popular and reference informative articles contest; contests for children and young audiences, etc. The winners will be awarded with the Certificate of the Full Delegate of the XXXXIII International Apimondia Congress. In addition, the best exhibits will be selected to be shown during the Apimondia Congress. And the smallest winners in the competitions for the children will receive special sweet and interesting prizes. Apimondia Sessions – Two scheduled General Assembly sessions of the Apimondia International Federation of Beekeepers’ Associations will be held within Congress, during which major issues concerning the functioning and existence of organization will be examined and approved, such as: charter changes, Apimondia Executive Board members and Science Commissions Presidents shifting, work planning for the upcoming years, forums and conferences planning, prior years financial statements and planning for the upcoming years, new members adoption and old members exclusion for violation or failure to pay the contribution, the election of the country that will host the next International Apimondia Congress in four years etc. Tourist program – several sightseeing tours over the most prominent monuments and attractions of Kyiv, one-day technical tours over beekeepers facilities in Kyiv and Kyiv region, many pre- and post-tours over the beekeeping and tourist sights of Ukraine – all that is proposed for delegates and everyone interested to meet and share experience with beekeepers and their apiaries, apiarian products manufacturers and their enterprises, to visit beekeeping museums and scientific institutions, Ukrainian nature and significant historical and cultural monuments of Ukraine in within the Tourist program of the Congress. Internet broadcasting of all events and activities (except for pre-and post-tour) of the XXXXIII International Apimondia congress will be available for beekeeping world audience on the Internet. Such event as XXXXIII International Apimondia Congress is going to have a great influence not only over the development of the beekeeping industry in Ukraine, but also will strengthen the image and prestige of Ukraine in the world, and help to establish many important international relations that will significantly enrich the world’s apiculture.